Starbar Bite Free Stable Fly Trap. $9.49. Today we're looking at the bite free stable flytrap. These are designed for your biting flies, horse flies mainly. It will get a couple of other kinds of biting flies, but that's the idea behind these. The color is designed to attract flies. And it's a sticky trap. It will keep them on there. I use these away from my kennels, but they are set up where they will go on a T-post. So if you have fencing around that uses T-posts on them, I just slide mine on top of my T-posts and they sit up high. They've also got a hanger on them so that, if you need to, you can hang them up. I've had them for a couple years now. As far as getting your big flies they work really well. It's just a sticky trap, but it brings them in and it will trap them. Bite Fly Stable Trap. I put two of the three I ordered on stakes so the top of each trap is no higher than four feet, and they are both in direct sunlight. They haven't attracted any stable flies though; just deer flies and other flying insects. They've been up for a couple of weeks now. I was really hoping these things would do the trick since the Victor Fly Traps weren't working any more, but I guess not. 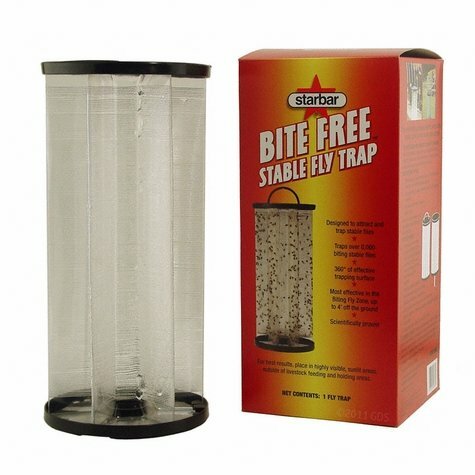 The StarBar Bite-Free Stable Fly Trap is scientifically proven to help effectively trap stable flies with no insecticides, and is economical and easy to use. Ideal for use around dairy operations, feed lots, swine facilities, stables, poultry farms, kennels, home and garden. Most effective when used in the Biting Fly Zone -- up to 4' off the ground. 1. Remove trap from box by the black end caps. Do not touch the clear midsection -- it's covered with sticky adhesive. 2. Place trap in direct sunlight, preferably at 10 feet away from structures. 3. Hang trap by top handle or mount on stake or pole (mounting device not included). Keep out of reach of children, pets, and wildlife. Does NOT attract and catch house flies. Set trap up to 4 feet off the ground, in the Biting Fly Zone. Place it in a highly visible sunlit spot where stable flies can easily see the trap. Keep trap clear of grass and other vegetation. Place traps outside of livestock pens, feeding areas, and paddocks where animals and children won't disturb them. Stable flies often lurk in trees, weeds, bushes, and fence lines near their hosts. Open arenas near these hiding spots make good trap locations. In large open areas, space traps every 50-100 feet. To Remove Adhesive: If the trap's adhesive gets on skin or clothing, remove it with waterless hand cleaner, then wash areas with mild soap and water. If on hair or animal fur, rub area well with salad oil, baby oil, or mineral oil to completely dissolve adhesive. Wash with mild soap or shampoo and rinse well. Repeat if necessary.